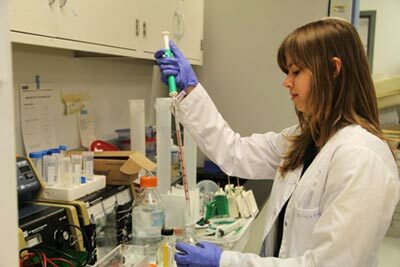 Ewa Nowara, a junior Biophysics major and a citizen of Poland, had wanted very much to perform undergraduate research at St. Mary’s. However, because most undergraduate research is funded by federal agencies whose primary mission is to aid American students, professors are often bound by strict hiring criteria that exclude international students. S. Colette Daubner, Ph.D., Associate Professor of Biological Sciences, wasn’t one to let a technicality stop a deserving student from pursuing her passion. She invited Nowara into her lab and helped her apply for — and win — a $3,000 grant by the Parkinson’s Disease Foundation so she could be compensated for her work. Now, Nowara works with Daubner in the lab probing the inner workings of tyrosine hydroxylase, an enzyme that helps synthesize neurotransmitters in the brain. Together they investigate the involvement of a protein called 14-3-3, which is believed to protect tyrosine hydroxylase from breakdown in the body. Because low levels of tyrosine hydroxylase may be linked to Parkinson’s disease, the medical community has a vested interest in understanding more about the enzyme. And Nowara’s work could provide answers. Even though her grant term has expired, Nowara has no intention of halting her research; she continues to put in 12 to 15 hours a week in the lab voluntarily, at least until more grants come along.